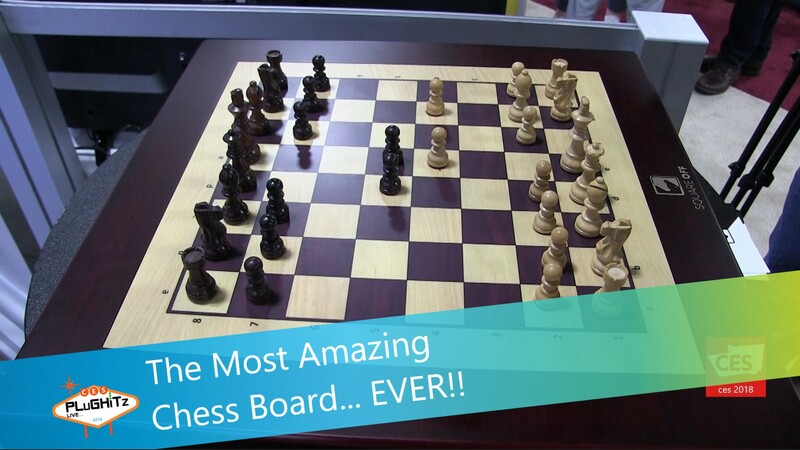 The Most Amazing Chess Board... EVER!! So, you see a nice wooden chess board while walking around a large tech show. You glance at it, give a little smile and almost walk right by to the thing that has all of the bells and whistles down the row, because it's just a chess board, right? Luckily our team didn't just keep walking when they came up to this one. I have to say that with all of the technology out there and after years of coming to CES, it is pretty rare for us to see a new product demo and have our jaws actually drop. But that's what happened when we saw the sorcery at the Square Off booth in Eureka Park this year at CES 2018. Square Off is an automated chess board that allows you to play against the built-in artificial intelligence. So, big deal, right? Electronic chess has been around forever. Well this isn't your grandpa's electronic chess. This game is played on an actual, physical chess board with real pieces. And after you take your turn, the built in intelligence not only calculates its next move, but it actually moves its piece on the board. It accomplishes this via built in pressure sensors, magnets and an electronic arm built inside. You have to see it to believe it. It even moves around other pieces and removes your captured pieces from the board itself. Don't know how to play chess? No problem! There is a training mode that will not only teach you to play but also how to up-skill your game. Go take a look at the two different models they offer on their website. Pricing for the Kingdom Board will be $330, and the Grand Kingdom Board will be $400.